A photograph of the board was sent to CNN. Board was made to look like categories in TV game show "Jeopardy"
(CNN) -- The Transportation Security Administration has launched an internal investigation into an air marshal field office in Florida where supervisors are alleged to have used a crew assignment board to ridicule and keep score on women, gays and minorities, sources told CNN. 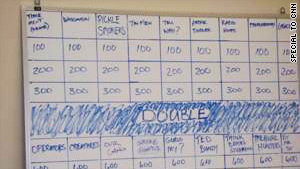 The board, resembling the TV game show "Jeopardy," includes categories such as "pickle smokers," "our gang" and "creatures," which sources said were names used by managers for gay men, African-Americans and lesbians. A photograph of the board was sent to CNN. The Transportation Security Administration confirmed the investigation in a written statement but did not elaborate on when the board was in use, where it was displayed or how it was used. "Following a referral from DHS Office of the Inspector General, TSA's Office of Inspection is conducting an ongoing investigation at the Orlando Field office," the statement said. "The Transportation Security Administration is dedicated to ensuring all employees are treated in a fair and lawful manner," it said. "Accordingly, TSA takes all allegations of misconduct seriously. The Federal Air Marshal Service will continue to provide its full cooperation and support to the investigation." TSA's Office of Inspection will present its findings to TSA's acting administrator for appropriate action, the agency said.